REWARD FOR SAFE RETURN Her human is due back from his 4th deployment soon!!! Please help!! 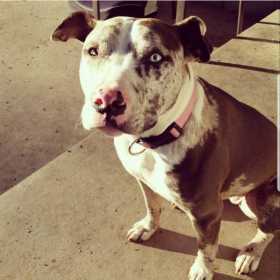 Our pit has been missing since 4PM today, 3/19! She loves to roam the neighborhood by pushing thru our fence gate to get loose. Usually she's back by now, so I'm a little worried. Her home is 409 college street, cleburne. She doesn't get along well with other dogs or cats. Please call or text if you see her! 817-487-3245 She has one white and one brown eye!